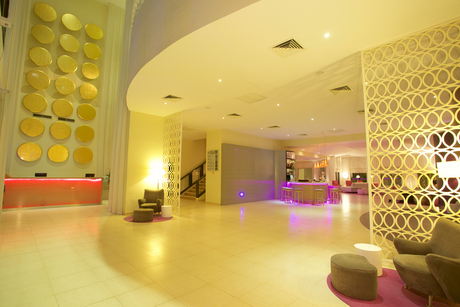 Discover the magic of Cancun at the Hotel NYX Cancun. You will stay at the heart of the best holiday resort in the Caribbean with spa, restaurants and a personal attention. 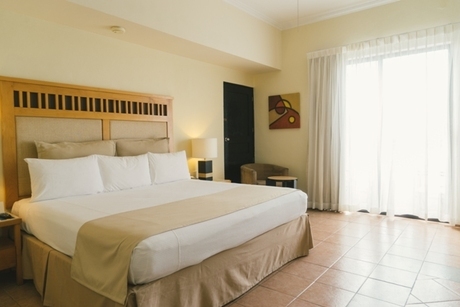 Nyx Hotel is close to Plaza la Isla in Cancun, near the best squares of the hotel resort area, ideal for families and couples who look for a romantic escape and reduced groups for business incentive events. If you wish to combine relaxation, fun and your best days at the beach during your holidays, discover everything that Nyx hotel can offer you: a privileged location close to Plaza La Isla and Plaza Flamingo, comfortable and refurbished rooms, 2 restaurants, 2 bars, room for events, gym, Jacuzzi, laundry and dry-cleaning services, age-appropriate activities, free Wi-Fi. 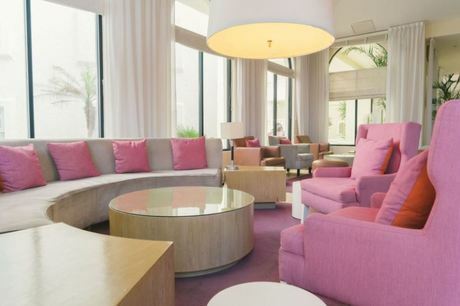 The 163 rooms and suites have been designed and equipped with contemporary furniture. All rooms have spectacular views of the Caribbean or the Nichupte Lagoon to enjoy a perfect sunset. The distribution of decorative elements, the amplitude, the option of connecting rooms and modern facilities in each room, create an ideal haven for any visitor. NYX Hotel Cancun has two swimming pools to meet the specific tastes of guests. One of them is quiet and peaceful, ideal for those who prefer to rest and relax; the other one with infinity overlooking to the Caribbean Sea, perfect for those who want to have fun with family and children. NEW RESTAURANT! Chianti: Offers delicious Italian a la carte dishes. Open from Monday to Saturday from 6pm to 12:00 am. 4 night minimum required. Reservations are required. Bellavista: This restaurant offers many different options of international cuisine, as well as daily buffet breakfast. Enjoy delicious dishes in a relaxed atmosphere. 7:00 am – 11:00 am. Deck: Enjoy an excellent lunch in Front of the Caribbean Ocean, Service open for lunch and dinner only a la carte. 12:00am – 5:00 pm for lunch 6:00 pm to 10:30 pm for dinner. Lobby Bar: Enjoy delicious drinks, cocktails and appetizers that you will find in the lobby bar of the hotel. 5:00 pm – 12:00 am. Pool Bar: After swimming and having fun at the infinity pool, you may want to visit this bar and enjoy refreshing cocktails in a unique, multi-colored ambiance. 10:00 am – 10:00 pm. Bar Deck: 12:pm - 10:30 pm. *Children fees are due at check in and will have to be paid directly to the hotel. Fees are subject to change. 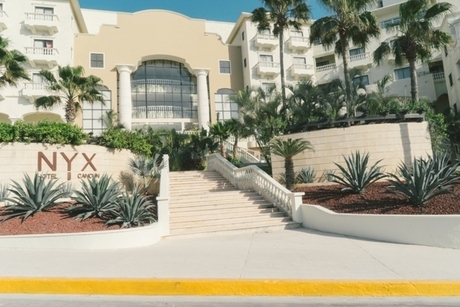 Hotel NYX Cancun is the best Cancun lodging choice for your trip to Mexico. With numerous amenities for guests such as room service, car rental, beachfront, you will wake up at Hotel NYX Cancun feeling ready to go every day for your time in Cancun. Don’t let this amazing reservation opportunity pass you by, book your stay at Hotel NYX Cancun today to make the most of your time in Cancun, Mexico.